Stressed? Can’t sleep? Consider one of these cool, soothing hues for your walls. When asked to describe the ideal ambience of their master bedroom, respondents in a recent Houzz survey cited calming, cozy and intimate/romantic as their top three picks. One of the easiest ways to achieve these desired qualities is through the use of color. This week, we’ll focus on a handful of colors that can bring a calming vibe to your retreat. Then stay tuned for follow-up pieces on using color to achieve a cozy and a romantic space. For a relaxing atmosphere in your bedroom, look to cooler hues — shades of green, gray, blue and purple — to lend a hand. These colors have been shown to reduce stress and anxiety. They can also make a space seem more expansive, so they’re a great choice if your bedroom is on the small side. Dark gray-blue. Of course, soothing needn’t equal boring. 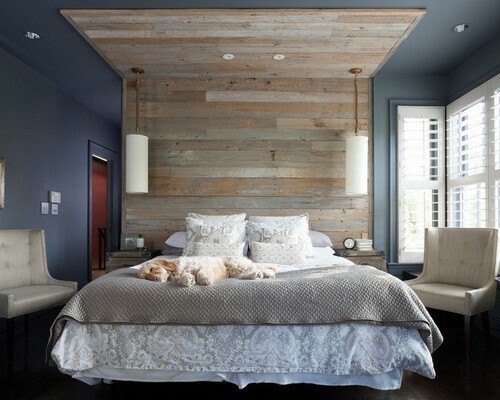 One of my favorite colors for bedroom walls is a dark gray-blue. It’s dramatic but still retains a calm, cool and collected vibe. If you have concerns about introducing such a deep color to your room, think about how you can break it up with a large piece of artwork or decorative headboard. To help bounce light around a room that has dark gray-blue walls, inject plenty of white elements and perhaps go for a classic bright white ceiling. One of the best ways to warm up a cool color palette is to include warm-hued materials such as wood plus natural fibers like sisal, sea grass and jute. Soft gray. For a lighter option, consider soft gray. Rooms with pure white walls and ceilings can sometimes have a cold and stark feeling. By adding a bit of gray tint to one or the other, you still get a light and bright space, but the slight contrast between the gray and the white gives a more finished and less institutional look. Icy blue. In the quest for colors that soothe and relax, I always recommend turning to nature for inspiration. One such hue is the color of the sky on a crisp, clear day. This is one of my favorite bedroom shades for folks who want something a little more colorful than gray but don’t want anything too dark. Look for a light blue with just a hint of gray to avoid a pastel baby blue that’s more appropriate for a nursery. Because of the touch of gray, icy blue can serve as a neutral in your palette, so you can pair it with almost any other color you like. If your goal is to create a restful feeling in the space, combine the hue with other neutrals such as chocolate brown or warm grays and taupes. Soft neutral green. Think sage, celery or a light pistachio hue. These are also colors taken from nature, and being surrounded by them while inside your home can elicit feelings of serenity and contentment. What I like about these greens is that you can go with a barely there whisper of color, and it still feels grounded and elegant and not at all pastel. Again, the trick is to find a green that has a good bit of gray in it. Lavender. This isn’t your teenager’s purple bedroom. A muted lavender wall color is a sophisticated option for a master bedroom. Purple hues are thought to be stress-reducing, so this super soft one is sure to lend a calming aura. It’s definitely a chilly hue, though, so think about how you can counter that coolness with warm wood floors or a warm-hued carpet. To ensure a grown-up atmosphere, try pairing lavender with dark grays and blacks. It also sings when partnered with silver tones.